A hurricane-like weather phenomenon that scientists call a "bomb cyclone" hit the western Rocky Mountains and US Central Plains last week, showering snow and freezing rains on millions of Americans in Iowa, Nebraska, Wisconsin, Minnesota and South Dakota. Image caption Frozen chunks of river ice are causing "ice jams" along roadways and towns. 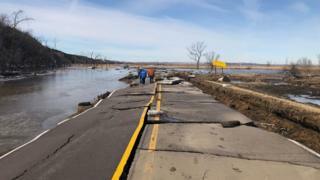 The National Weather Service (NWS) said flooding would continue across parts of the Central Plains and Upper Midwest for the rest of the week. As of Tuesday, over eight million people remained under NWS flood warnings, according to CNN. President Donald Trump described the floods as "devastating" and said the White House would keep in close contact with state officials. Vice-President Mike Pence will be visiting the region on Tuesday to survey the damage. In a statement, Wisconsin Governor Tony Evers said "warm temperatures and rain the last few days have caused much of the heavy snowpack and ice to melt resulting in flooding, ice jams, and rivers and creeks to rise". The US Army Corps of Engineers told the Associated Press more than a dozen levees have been breached across Nebraska, Iowa and Missouri. At least three people have been killed, and two other men have been missing for days. But an estimate from the Nebraska Farm Bureau on Monday was far higher, estimating the total cost of farm and ranch losses at around $1bn. "This wasn't a gradual rise," Mr Crecelius said. "It's flowing fast and it's open country - there's nothing there to slow it down." On Friday, the Cooper Nuclear Station, a power plant in southern Nebraska, declared an "unusual event" had occurred as the swollen Missouri River threatened the facility. 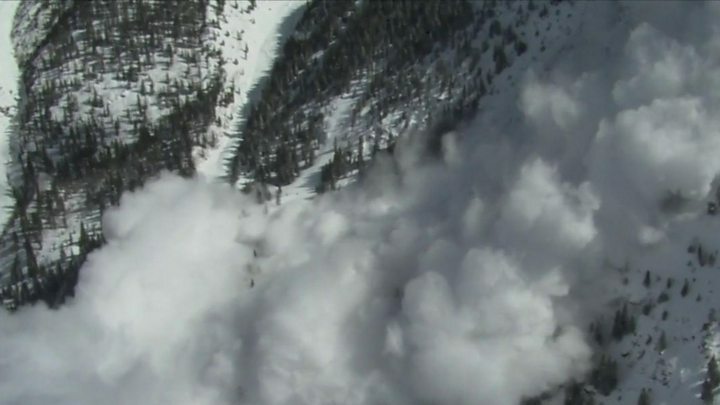 The river runoff follows heavy snows in the Rocky Mountains, including in the state of Colorado which has been experiencing a unusual number of avalanches due to "bomb cyclone" conditions. Video Why is Colorado having so many avalanches?